The USGA and the Royal and Ancient spent six years working on simplifying the rules of golf. As a golf purest, I don't like changes, but overall I think they did a pretty good job. The one I dislike the most is the drop from knee height. To me it looks awkward, cumbersome and unnecessary. Let the drop be anywhere from waist high to the knee. But the biggest change for most golfers is the option to putt with the pin-in the hole. This change has surprised the rules makers. Its intent was for speed of play, especially for the amateur golfer that doesn't usually have a caddy. But it now has become a possible performance enhancer. On the professional Tours, you are seeing multiple players putting with the pin-in on all putts. They would only do that if they thought that the pin would be giving them an advantage. The PGA Tour is the testing ground for innovation. If there is a way for them to lower their score, they will find it. We are only two months into this new rule. We will know a lot more in the months ahead from the actions of the best professionals. Dave Pelz, the NASA scientist and putting guru, did a study in 1990 on the effect of the pin on putts rolling at different speeds. His results were conclusive that having the pin-in was a definite advantage. Bryson DeChambeau has putted with the flagstick in on all putts this year. Bryson states that if the course is using standard ½ inch fiberglass pins the pin will deaden the momentum of the ball. However if the pin is thicker and not flexible, he will opt to putt with the pin-out. Since the beginning of the year numerous studies have been published. All have determined that the pin-in is an assistance. 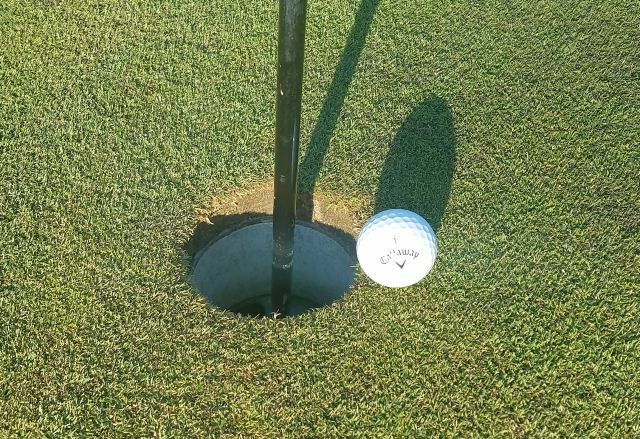 For a putt that would travel three feet past the pin, if it did not hit the pin, the percentages are significant in favor of leaving the flagstick in. If the putt were going even faster the advantage gets greater. So why are only a handful of professionals putting with the pin in? First, they have played their entire life with the pin-out. Hard to break an old habit and having the pin-in might be a distraction. Second, they have incredible feel and distance control. They are not ramming putts well past the hole. Based on the circumstances of the putt, the good putters are either playing to just roll the ball into the cup or have a speed that will carry it 12 to 18 inches past the hole. At those speeds having the pin in or out would have no impact on the outcome of the putt staying in the cup. I have been a reasonably good putter my entire life. I have good feel and distance control. This is what I would do in a tournament situation. I would leave the pin-in on all putts over 20 feet. Reasoning is that speed control is harder the longer the putt and if I err on the long side, the pin could help me. From 15 to 20 feet, it will depend on the speed of the green and if it is downhill or uphill. Inside of 15 feet, I will always have it out. For the average amateur, I would recommend leaving the pin-in on all putts. First, it will speed up play, but it definitely will be an advantage to have a backstop on putts hit too hard. Second, most amateurs do not aim properly. Having the pin-in will better center your concentration on your aim point, the narrower the focus the better. That is the main reason that Adam Scott has chosen to putt with the pin-in. The USGA and R&A have inadvertently given golfers an advantage. Golf's hard enough; we should take advantage of this assistance. 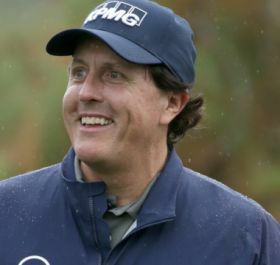 Phil Mickelson was at his best this past week at the AT&T Pebble Beach Pro-Am. That was his A+ game. It is fun to see someone play that well and be in full control. Phil usually has his moments where the ball could go anywhere, but not this week. Accuracy off the tee and pinpoint iron play were the strong points of his game in capturing his 44th PGA Tour victory. On Saturday, when the conditions were extremely tough on the Pebble Beach Golf Links, Phil had to battle the elements of wind, cold, and rain. Of the three courses that day, he faced the toughest challenge. He was able to hang in there with a good game plan and excellent execution. If you are not able to control your ball flight and distance, those conditions will kill your score. Phil had a good week driving the ball, but what I was the most impressed with was his iron play. He hit a variety of knock-down, three-quarter, and half shots that were masterful. In windy conditions your swing and body are tough to remain in balance. The higher you hit the ball, the more difficult it is to control distance and direction. Phil used a shorter swing and abbreviated finish to keep in balanced and hit the ball lower. We all know about Phil's great touch around the green and variety of shots that he has. He used the same imagination and skill on his approach shots, never hitting the same shot, but still getting superb results. He was an artist at his best, showing his extraordinary skills. Harry Vardon, the greatest golfer from the early 1900's, was a proponent of less than a full golf swing when approaching the green. "Why swing fully when an easy half swing with a mashie niblick (7 or 8 iron) will be more consistent." In 2016, I wrote an article about the 125 yard 7 iron and the importance to become proficient at controlling the distance with all clubs. Expert players do not have one golf shot or swing when hitting a regular 7 iron. I would guess the combinations of low, medium, high, hook, slice, punch, spin rate, etc. could be endless. I have about fifteen ball flight combinations that I can create with my seven iron. I would guess Phil has many more. Click on this link and read my article about the "125 yard 7 iron" and ways to practice and improve your distance control. Phil won for the fifth time at Pebble Beach. That bodes well for his confidence for the U.S. Open that will be played at Pebble in June. However, it will be a totally different golf course and conditions. Rough will be higher, fairways narrower, greens hard and faster, and stretched to its' maximum distance. Pebble will have all its' teeth for a major championship test. I hope Phil has his "A" game ready in June. Seeing him dominate this week, we could see a similar result in June.